Your financial health is as important as your physical health. Certainly then, your credit score is a vital indicator of the former. Whether it’s the new apartment you are eyeing or a business that you are planning to set up or simply the medical expenses of your loved ones, a loan could be required anytime. As such, the first thing a bank looks for, before lending money, is whether you qualify with the required credit score for a personal loan or a car loan or a consumer loan. This is to ascertain your risk value to the bank. Following are just some of the key ways to ensure you keep your credit score, well above average. 1. Pay your dues on time: This is the single most important factor which influences your credit score. Clear your outstanding dues on time. When you spend from your credit card, make sure you don’t just pay the minimum amount required to continue the usage but pay in full or the maximum amount which you can afford for that particular month. 2. Cut your Credit Cards: Although there is no restriction on the number of cards one can use, it is better to have only as much as you can pay for. For instance, if you have multiple credit cards, then your total credit increases, but then you may also have to pay a minimum amount to maintain the cards. And It’s easy to lose track of the payment dues especially if they fall on different dates and have a variable amount. A series of defaults is good enough to pull your score down. A better way to increase your credit limit and decrease spend ratio is to have no more than 3 credit cards at a time. If you have only one, and you are paying the dues on time, then nothing like it. One more benefit of minimizing your credit cards is cutting down the probability of identity fraud, by restricting the loopholes leading to your account. 3. Use your Credit Card responsibly: Most of the time, rampant usage of Credit cards is accountable for a low Credit score. It is a good practice to use your Credit card with the thumb rule that you restrict your spending upto 30-35% of your credit limit. If you frequently need more money than that, then you may opt for another Credit card. Think of your Credit Card as a necessity, not as a luxury. 4. Old is gold: A good history of timely payment exhibits responsible behavior. Do not hasten to erase your records from the accounts once you have paid your dues in full, because a trail of paying EMIs on time is actually a score booster. Also, in case of credit cards, if you are planning to discontinue the excess ones, make sure that you retain the older ones and eliminate the newer ones. A credit card with a long history of timely payments indicates a good track record. 5. Limit your loan applications:It could happen that you apply for a loan at a bank, but it gets rejected owing to a low credit score. In such case, do not hasten to re-apply with another bank as they would be able to see your rejection by the previous bank. This could further hurt your credit score & make things worse. In case of Credit cards, applying for multiple cards at a time indicates a credit hungry behavior. 6. Be cautious with inquiries: Whenever you want to buy a new car or a new house, you would want to opt for a loan. And it’s a common practice to enquire with various banks to compare and contrast the interest rates before you crack the perfect deal. However, banks check your credit score everytime you enquire. Such an enquiry is termed as hard enquiry. A number of consecutive hard inquiries is enough to hurt your credit score. In fact, as an immediate consequence, it may even affect the amount of loan that you are entitled to. 7. 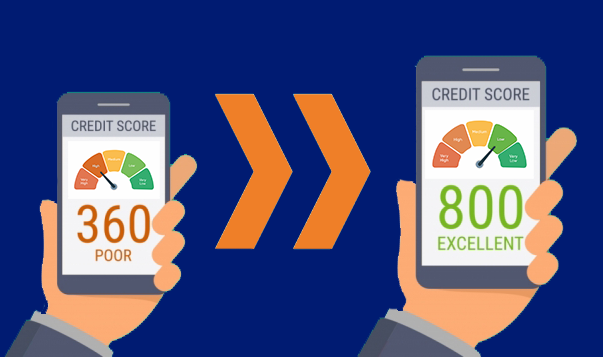 Keep a track of your Score: Checking your credit score regularly is a good and harmless practice. It helps you keep a check on your financial health and accordingly devise adequate measures to rectify it. You can check your Credit score for FREE and obtain a detailed report by availing CRIF services. You’ll be required to input some basic information and answer a few questions to get to the report. There’s no limit to the number of times you can check as this is a soft enquiry and does not affect your Credit score. Previous Previous post: 5 Financial Lessons To Learn From Ramayana, This Dussehra! Next Next post: Checking My Credit Report Affects My Credit Score? Or Not?